FOR IMMEDIATE RELEASE: "Seligmann Gallery Announces Major, One-Man Exhibition of Paintings and Drawings by Gustav Rehberger. In the world of Contemporary Art, wherein the issue of minds and hands seemingly devoid of feeling is highly prized and eloquently rationalized, Gustav Rehberger is a rare and miraculous anomaly." "Unafraid of feeling, undismayed by the rawness and power, this artist has had the courage to pursue truth in form, and the mastery to make line and gesture living things. While the world and most of its artistic visionaries have become ensnared by an intellect grown malignant and all-too obviously detached from the life force, Rehberger has consistently and convincingly sought to remind us that beneath the rationalistic façade of the modern age, man’s awesome confrontation with himself and the universal forces of spirit and nature continues. His work resounds as a challenge to our dulled and dormant vital centers – prodding us….goading us….pleading with us to remember that beyond the wasteland of our sterile passage man may yet return to the path of feeling. Firmly and unmistakably versed in the traditions of the masters of past ages, Rehberger has managed to go on to achieve his own unique and turbulent level of seeing and mastery of technique, which while continuing its faithfulness to living line and truthfulness of image somehow transcends the confines of the very reality it depicts, and in the process allows us the privilege of seeing energy coalescing into the color and texture and form we call life. Described as a “Volcanic Expressionist,” this artist’s work does not, however, descend into the quagmire of sentimentalism. It does not attempt to deceive by virtue of the slight-of-hand of romanticism, nor does it seek to depict the world through an artificial lens that mistakens photography for art and represents life as smooth, flat and ordered. Instead, his objective has been capture a surging wholeness, a “livingness” that emerges from the chaos to seek fulfillment in the consciousness of form. In strikingly original compositions that display maximum power and superb rhythm, Rehberger appears constantly in touch with the very “aqua vitae” of the spirit. His heroic interpretations of Man, Woman and Beast communicate the ageless wisdom that it is only through from that one can discover the formless, only in chaos that one can comprehend harmony, and only in energy that one can glimpse the living universe. The one-man show of drawings and paintings by this Austrian-born artist, who has exhibited in leading galleries and museums, including the National Gallery in Washington, D.C. and the National Gallery of London, will open October 18, 1977 at the Jacques Seligmann Gallery, 5 West 57th Street, New York, NY"
Theresa D. Parker. "Seligmann Gallery Announces Major, One-Man Exhibition of Paintings and Drawings by Gustav Rehberger." Jacques Seligmann Gallery, 1977. And so he was. Whether working in pencil, pen, gouache or oil, his uncompromising individualism was glaringly evident. Every line, every stroke was charged with a continuous flow of activity; whirling, driving--a blaze of tempests, turbulence, exciting commotion when one would expect the subject to leap off the paper or canvas." This chromatic fury, however, was not born of sheer imagination. Living images of his childhood, be it a raging flood, a violent storm, overturned wagon or horses on a rampage - all eruptive violence - made such an indelible impression on young Rehberger that throughout his professional career these mental treasures triumphed as a viable source of inspiration. Gustav Rehberger died in New York City on July 22, 1995. He was 85 years old. Although he was best known for his towering achievements, his drawings and paintings of the human figure, of equestrian and horse subjects and apocalyptic themes, his religious works, of which he made many, were marked by intense reverence - treated by the brush of an artist who truly believed in the majesty of God. Gustav Rehberger was born in Riedlingsdorf, Austria the second of Elizabeth and Josef Rehberger's three children. Fame came early to Gustav Rehberger. Drawing from inner compulsion, he was a celebrity by the age of four. As a school boy his drawings were greatly admired and drew honeyed words of praise from his teachers. In 1923 Gustav came to the United States with his family. They settled in Chicago. His career in the world of art took off at once. The gifted Austrian was fourteen years old when Chicago newspapers carried such banner headlines as "Immigrant boy in the United States one year wins scholarship" and "Austrian school-boy ice artist wins chance for career." Gustav Rehberger's meteoric career literally began with a cake of ice, a large cake. In Chicago's Mozart School playground, on the skating rink, the new arrival painted a landscape that showed snow-capped mountains, green forests, vegetation - all reflected in a still mountain lake - memories, of course, of his beloved Austria. Following a meeting of the playground's directors, Gustav's amazing talent was determined worthy of a scholarship to the Art Institute of Chicago. Within a year he was a awarded a second scholarship, to Art Instruction Schools of Minneapolis. At fifteen Gustav Rehberger won first price in a national contest and another competition in Chicago. This latter work so overwhelmed the judges that they requested he re-draw the picture in their presence to prove he actually made the original drawing. With the onset of the Depression circumstances compelled Gustav to refuse two college scholarships. During those lean years his father was unemployed and without hesitation Gustav assumed the role of bread winner. Although still in his teens young Rehberger was offered more work that he could handle. With uncommon adaptability he did lettering, typography, graphic design, industrial design, illustration, and even some sculptures. He sketched and painted whenever he found time. his distinctive style soon came to the attention of collectors and visitors to national museums and other juried exhibitions. After his military service, where he served as an artist in the United States Air Force, proving his love and loyalty to his adoptive country and fellow G.I. 's, Gustav settled in New York, where upon establishing a studio in Carnegie Hall he began doing commissioned work and independent painting. 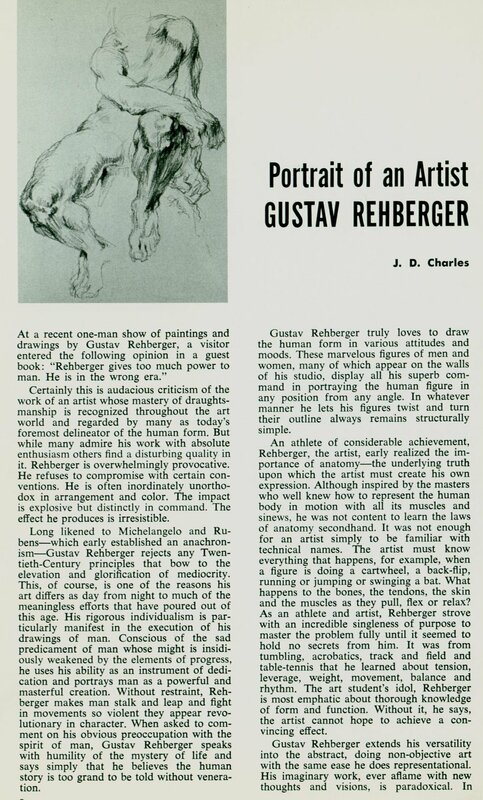 Until his death in July 1995, Rehberger taught portrait painting, composition, figure drawing, and figure painting at the Art Student's League in New York, where he became a living legend, the absolute idol of those he taught. If ever his students wondered why Rehberger's art was distinguished by powerful structural composition, they soon learned that by abandoning the sacrosanct rules of classical tradition to follow his own moods and whims he remained distinctively Rehberger. Gustav Rehberger will be missed by art students from all over the world. But he will not be forgotten by them. In attending to their own careers surely they will hearken to and heed the words of the master who beyond the grave will uncompromisingly admonish, 'It is the concept that is the all-important core of a picture. No amount of good painting will redeem a poor conception. And remember that worthwhile art is never achieved by mere accident.'"